Read this interesting article on various Java related initiatives that are trying to bring opensource sanity to projects like Android. The Duke’s choice awards are out for the year 2010. Congratulations winners! Meeting of Bhimavaram Open Solaris User Group and inviting new members. Review of specification for new hardware that would install OpenSolaris in labs. Guidance for summer projects in open source. 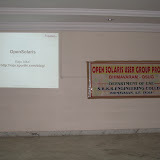 The OpenSolaris meet is attended by 3rd year students. Most of them have internal examinations that afternoon, so we did a very short meeting covering features of OpenSolaris. Since I don’t have my laptop with me in the conference room, I used just the slide deck and there are no interactive demo sessions. My next visit will for sure have more interactive sessions. We also talked about potential summer projects in the areas of or using OpenSolaris, OpenJDK, Netbeans, Eclipse and others. Most ideas are around minor bug fixes, extensions and nightly builds using code management tools. We may soon have a couple of phone call sessions involving faculty. I also reviewed the specifications of new hardware for installing OpenSolaris in the labs. All of them are PCs with good amount of RAM, descent CPU speed, nVidia graphics chips and AMD X64 processors. I left a copy of OpenSolaris Developer Preview at the college for them to try out. It is fun and technology again. No time to take photos. Shared some ideas, issues, tools and tricks with my OpenSolaris buddies and some of the attendees. More socializing with Sun folks. Interacted with more attendees and suggested hints on the best ways to learn (a) OpenSoalris, (b) Java technologies. There are some in depth discussions on virtualization, types (and the good, bad & ugly) of hypervisor technologies from Sun and others. Had to shorten my visit today due to other commitments in the evening. Short, yet sweet! If you are a student participating in Code For Freedom, hurry up and submit your ongoing work. The last day for the contest is 14th Feb 2008, just two days away. This week, I checked out ibibo, a social networking site targeted primarily towards India’s netizens. At first, I thought that this is similar to facebook, but later found some key differences. ibibo depends heavily on pre-cooked applications (blogs, photos, polls, yada, yada) and facebook has a rich set of user or group contributed applications. facebook gives you a feel of being event driven and ibibo gives you a feel of conversation/content driven, mostly due to blogs, questions and polls. facebook seems to be exploring an individual’s prior contacts, but ibibo’s contact building (at least for now) seems to be pretty random. I haven’t explored ibibo much (yet), but there are already a few positive things I can tell, when compared to other community/networking sites. Their photo uploading interface is lot better. You can upload a single photo at a time using the “browse” selection or launch a Java applet to upload a large number of photos at once. This works fine on all platforms including Linux and OpenSolaris, making life easy for power sharers. I am usually irked when I have to upload lot of photos at once to other photo sharing sites from a Unix based desktop. The account comes with built in blog interface. I am surprised to see a bunch of frequent bloggers. There is a bloggers hall of fame! Lot of applications are tuned to Indian scenarios (like searches and polls based on India current affairs, location specific Q&A, etc.) For example, a question like “How do I reach Taj Banjara Hotel in Hyderabad?”. India’s maps or search engines are not yet detailed enough for answering such questions. Overall, this is a site worth exploring, especially if you are in India or know the Indian scenarios. BTW, downloaded NetBeans 6 Beta recently, but am yet to test the full power of that. James Gosling is appointed to the Order of Canada. Congratulations James!